The 2017 Genesis G90 is the second model year of Hyundai’s top of the line mid-size sedan. It’s sleek, it’s luxurious, it’s a whole lot of car wrapped up in a really nice package. It’s high-end and delivers on the high-end promise. 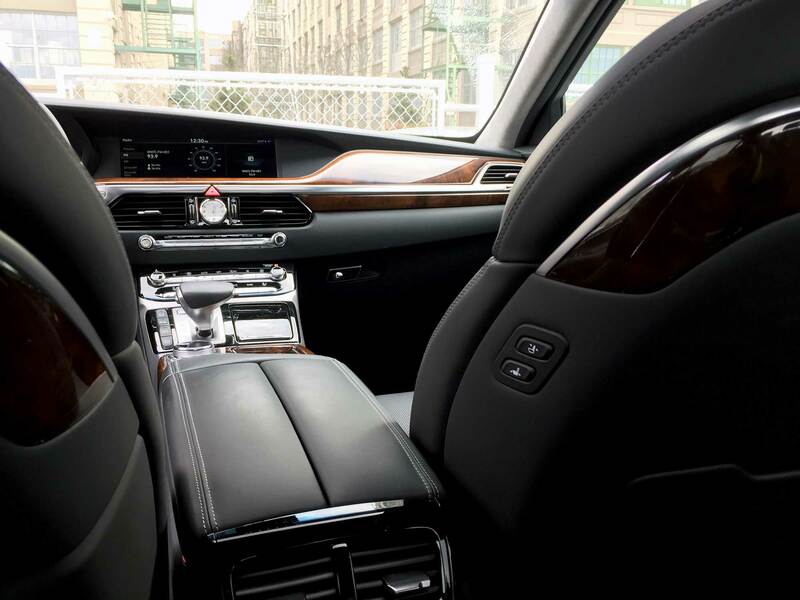 The Genesis G90 is a well-assembled machine with plenty of horsepower, plenty of comfort and a really thoughtful and well-implemented cockpit. The exterior of the G90 is sleek, flowing and graceful. There are four 2017 Genesis G90 models. At the lower ends, we have two rear wheel drive models, a 3.3-liter twin turbo V-6 ($68, 100) and a 5.0-liter GDI DOHC V-8 ($69,700). Both models can be had in all wheel drive versions, at $70,600 for the 3.3-liter twin turbo V-6 and $72,200 for the 5.0-liter V-8. Both of the 3.3-liter twin turbos produce 365 hp and get 17/24 city/highway, while the 5.0-liter V-8s produce 420 hp and get 16/24 city/highway. 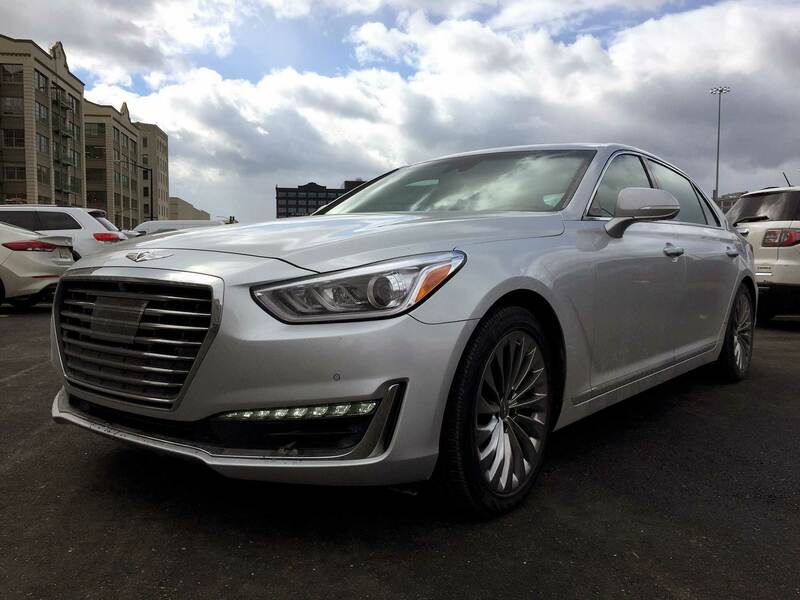 With the specs of the Genesis G90 and the prices all being so similar, the choice of trim level is largely left up to personal preference on engine and drivetrain. 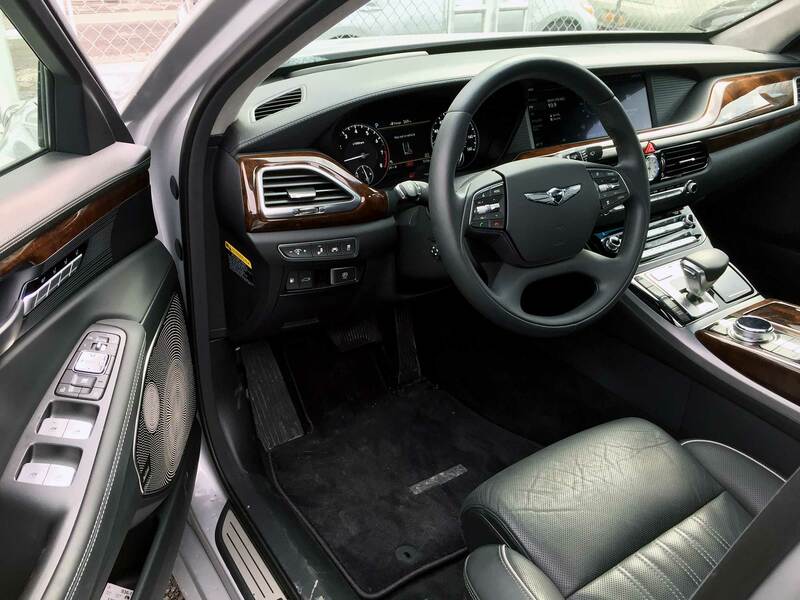 We tested the 5.0-liter V-8 Genesis G90 Ultimate with rear wheel drive, 8-speed Shiftronic transmission with paddle shifters and intelligent drive modes. Who is the 2017 Genesis G90 for? The 2017 Genesis G90 is an adult luxury-liner for adults. In every design stroke and notion, the G90 is refined, grown up, serious and intelligent. 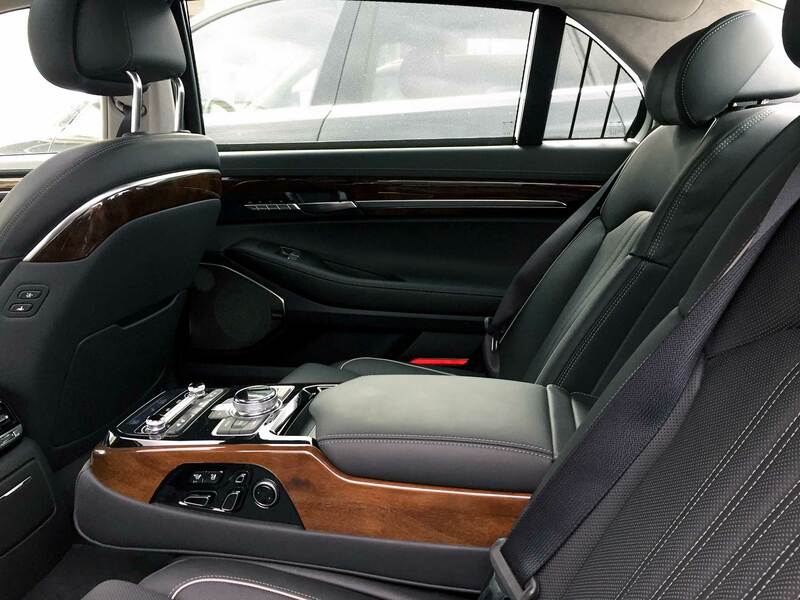 The Genesis G90 is for serious-minded people who need to get from A-to-B in style, in silence, wrapped in Napa leather, real wood trim and great expanses of glass.The Genesis G90 isn’t a car for people who like driving, as much as it is a car for people who might like to be chauffeured. Our testing team took this 2017 Genesis G90 from our Industry City offices to destinations all across Brooklyn, and then into a blizzardy upstate New York for the weekend. The Genesis G90 is about two days long, bumper to bumper. Drive Deputy Editor Josh Condon remarked that a front-end collision would take “a full three minutes” to reach the passenger compartment. True, it’s long. Four and a half inches longer than its predecessor, the Equus. The back doors are a ratio of about 2:1, length:height. Inside, you notice, that this is a really nice luxury automobile. NO TOUCH SCREEN. This is a amazing, refreshing, interesting and a bold design decision. There is a gorgeous 12.3-inch display laid into the G90’s gorgeous dashboard, but don’t go poking at it -- this cockpit is run by control knobs and buttons. And said knobs and buttons are thoughtfully arranged, provide good feedback and are easy to turn, flick and push without taking your eyes off the road. The display screen is crisp, uncluttered and helpful. The maps are very good, the panoramic aspect ratio pleasing, the menus well arranged and rarely needed. The Genesis G90's LCD display isn't a touch screen, thankfully. Controls are knobs and dials. The Genesis G90, especially in this 5.0-liter V-8, is good at luxurious power in a quiet and comfortable ride. You don’t feel the road much, but you probably have other things on your mind. The big V-8 give you 420 horses to play with, so this is a large touring sedan with serious fighter-pilot power for cutting up the commute. Our test Genesis G90 was a rear-wheel drive model, and we were slipping all over the place out there in the upstate snow on poorly treated roads. This was a bummer because it prevented us from a trip to the wine store and the market, meaning we had to dine on what was available at the house (homemade Shrimp and Herb Risotto), snack on homemade potato chips instead of apple pie and drink what was on hand. But, I’m not going to ding the G90 too hard for this because the roads were really, really bad. I’m not sure I would have made it to the store in my 4x4, but I would have loved to have been out there in the G90 with optional all wheel drive model with active torque control. Our tester Genesis G90 hides in the pine trees of upstate New York. I would absolutely buy the Genesis G90, if for no other reason then to pledge my dollar vote for buttons over touch screens and organization over clutter in information design. A lot of marques can pair up performance and design and do it well, but this Genesis G90 excels in its elegant execution of controls. The style, comfort and luxury are all tippy-top and there is very, very little to dislike. A quick note on the safety systems: They are excellent. The Genesis G90’s Lane Keep Assist was accurate, quick to engage, eager to remain engaged and smooth in the turns. Combined with the excellent adaptive Smart Cruise Control, and the car is driving itself for you. 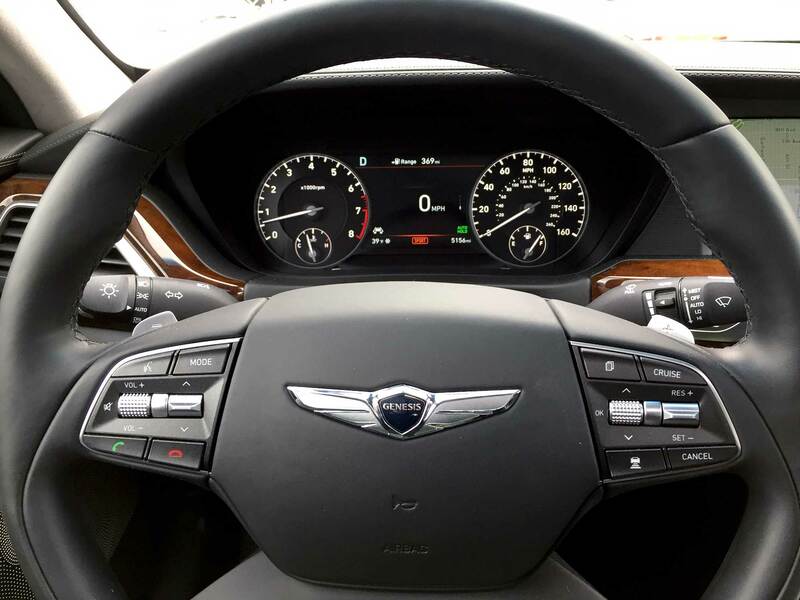 And the G90 seems perfectly comfortable calling the shots, as long as you’ll do it the favor of keeping your hands on the steering wheel. The whole system is smooth at interstate speeds and in stop-and-go traffic. If the G90 might be for someone that wants to be chauffeured around, the safety systems go the distance to simulate that experience. One look into that expansive back seat with it’s own comfort controls and you’ll wish you were back there instead of the driver’s seat.